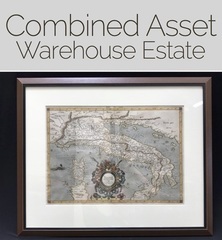 CA170170 – Combined Asset Warehouse Estate – Antique Art & Maps, Vintage Barbies, Native American Items, Jewelry, Camping, Antiques and More. AUCTION CLOSING DATE: Sunday August 13th beginning at 5:07 p.m PDT Bidding closes the first item at 5:07pm PDT then closes 5 items per minute thereafter to the last item in catalog order. LIVE INSPECTION: Thursday August 10th, 2017 3:00pm – 7:00PM and Friday 8:30am-4pm. REMOVAL: Monday August 14th 8:30am-4:00pm and Tuesday 8:30am – 12:00pm By Appointment Only. Vehicles buyers can have a few more days to pickup.